The organizers were really helpful in trying to further communicate with us with their Malaysian slang which totally made it so much easier for us to understand on the unique points of each product. Blarrrrr...... So annoying, the cover girl is so freaking pretty. Yes, I know, mostly probably photoshoped but it's a photoshop job well done. Of course, in every beauty workshop, it's a common cliche to organize a demo session. Like the title of this blogpost stated "Office to Party Look" which is also another overused makeup theme in workshops but I can't blame them because that is truly what working ladies need on a daily basis. Many times we have so many commitments around that we constantly need to find time to meet up with your friends or you are going to be labelled as "Lupa Kawan/Poyo" (Stuck-up/not friend enough). So the theme is rather relatable to many ladies out there. Okay, now you guess, this is Office Look or Party Look? If you don't know, KATE Cosmetics is actually a sister company under the Big Mama Kanebo and Kanebo is definitely up to the standards to categories them as a rather luxury brand. Another sister company would Freshel, focusing heavily on skincare. It's my first time hearing about it and so far, it has impressed me. I am currently obsessed with the Freshel Cleansing Lotion (totally bought one bottle back, cost me RM35 after discount) It's light and refreshing, not suitable to remove waterproof eye makeup but good enough for removal of foundation, BB cream, sunblock and etc. The potted containers are their new launched babies, the 5 in 1 gels. I can see that this is the current trend as we girls are getting lazier and so tired all the time from the long-hours job and hard-core partying, we just don't have time to sit down in front of the mirror every night just to apply step-by-step skincare anymore. So humans with our intelligent minds inventively came up with a new innovation of putting everything into one to meet our demanding wants. Our wish is finally fulfilled, so no more worries of not knowing what to apply next and spend more time on your beauty sleep. Will review more about it soon, I have the Whitening Gel. Freshel BB cream, it's a BB cream, smooth & medium coverage, nothing more to say. Apparently the KATE Powderless Liquid for Cover foundation is also a new product which is a product where the liquid foundation turns into powder feeling on your skin after applying so you don't have to apply anymore powder after that. It's nice but I didn't really test much of it so I can't really tell you much. Plus, its nothing really new because there are other products out that pretty much does the same thing. And we also have the KATE Mineral Loose Foundation in powder form on the right. Cover Foundation in compact powder form. I like how they package the KATE Eye Shadow Base in a tiny metal pot. So cute and chic plus it works nicely on the lids. Now this is the STAR product of the whole new 2013 collection. 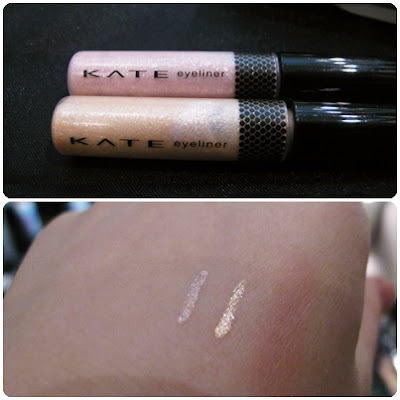 The KATE Goldish Eyes Eyeshadow quarts. If you can see the elevated parts of the shadows, those are the ones filled with real, pure gold. 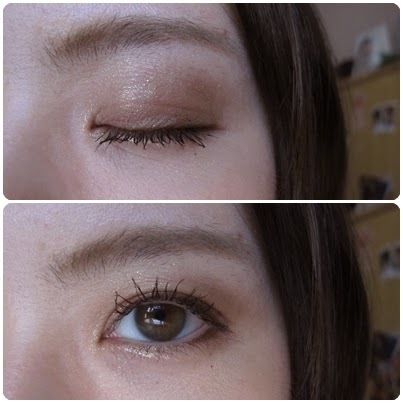 A small amount but that hint of gold will help to create an enticing eyes. It sounded interesting at first because "OMG, we have bits and pieces of pure gold on our eyes"...... then it got me thinking, do people really want real gold being applied onto our eyelids just for that 10 to 12 hours max. 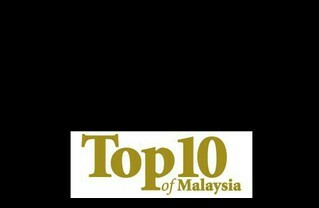 I mean at the end of the day, we still have to remove it and throw away those precious pure gold into the rubbish bin. The idea of having real pure gold sounds great and made the product feels luxurious but does it really matter, it looks like finely-grained gold coloured glitters to me. #SomethingToThinkAbout . Other than that, the colour is pigmented and feels nice. However, it falls like crazy, so you need to apply eyeshadow based and pat the colours on gently to create that beautiful effect. 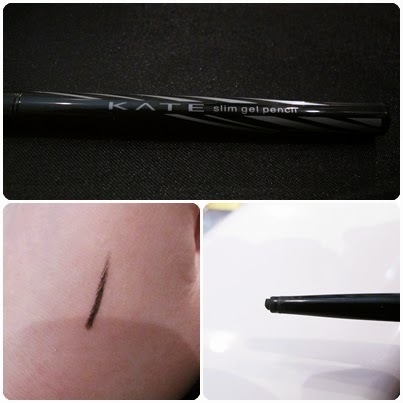 For some reason, all of KATE's pencil form products are so freaking thin. I love it! It's so pretty with their simple design, makes it so easy to travel with. Apparently it is gel inside but hardness when twisted up and it is non-retractable. I honestly don't know how I feel about that. I'm not a big fan of the non-retractable idea because I'm a mess, I like to be greedy and twist loads of products out when applying. Maybe it's just me. :) But the product is not bad, I used the brown on my lids and it looks like the most natural colour on earth. Glitter liners for the inner corners. Shine bright like a diamond.... Pretty but not practical for an everyday office look. It's for your party look to add extra bling-bling. Nothing much about the blusher but they are packed with the most awesome mini kabuki! I would totally just buy the blush for the brush. Contour Powder. This colour is so suitable for people with yellow undertone skin, Asian skintone. People like my skin with red undertone still able to use but have to be a bit more light handed on it. I used the Goldish Eyes eyeshadow, gel liner, gel mascara, glitter liner and brow gel. Lols, that's a lot of gel. Thank you KATE, I had so much fun! It is nice to be back for events. More to come! Yes, reviews of some of the products too. U are so funny in your posts..
that's an office look...:) cz the makeup is light. Definitely wont be scared by your naked face cause u are already looking pretty without make up babe ! That pic looks a little too glittery for office look. I used to use Fresnel BB last time. It's nice but I could get cheaper ones with the same effect, so I moved on. Acne treatments that WORKs for me!